Haven Terra is a brainy, shy high school outcast. But her life changes when she is awarded an internship at a posh Chicago hotel. As Haven begins falling for Lucian, the dashing sidekick to the glamorous hotel owner, she discovers that these beautiful people are not quite what they seem. With the help of a mysterious book, she uncovers the evil agenda of the hotel staff: they're in the business of buying souls. Will they succeed in wooing Haven to join them in their recruitment efforts, or will she be able to thwart this devilish set's plans to take the souls of her classmates on prom night at the hotel? * "Smart, well-crafted and sophisticated; without a doubt, this belongs on the top of the stack of the current crop of angel books. More, please!" --Kirkus Reviews, starred review "Part The Picture of Dorian Gray, part The Devil Wears Prada, this original and engrossing story will keep surprising readers right up to the thrilling climax." --Josephine Angelini, author of Starcrossed "Haven is a character who will definitely surprise you--in the best way possible. Mysterious and deliciously creepy, Agresti's debut will keep you turning pages until the explosive climax." --Cara Lynn Shultz, author of Spellbound "Agresti's story accelerates to an exciting climax, and the blossoming romance is sweet and satisfying." --Publisher's Weekly "Move over, Twilight!" --US Weekly "Equal parts romantic and mysterious, and will keep you itching for the next installment!" 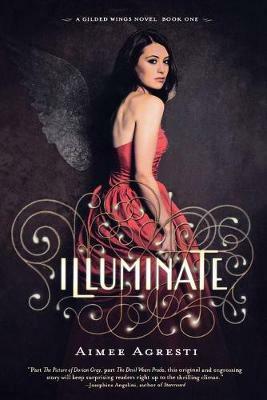 --Seventeen.com "Such an enchanting book and we can't wait to read more in the Gilded Wings series. While the cover reels you in (How could it not? It's so pretty! ), the words inside keep you reading. There's angels, mystery, beauty . . . which all rolled up into one, makes it magical."